The tramp merchant trader Ginny’s Delight was a one-of-a-kind vessel, originally owned and operated by Captain Ontario Barnes and various free-lance crew personnel picked up at starbase bars and flop houses. Built in 2257, the ship acquired a number of “special modifications” along the way that made her unique. One of the most important original alterations was the Type FP-2 photon torpedo mount situated beneath the forepart of the warp nacelle, purchased and installed early in the Ginny’s career. Being in such close proximity to the warp drive, the mount was extremely difficult to detected by most standard sensors, and the Delight often surprised a number of unwary pirates, eager for an easy kill. The Ginny’s Delight was streamlined and capable of planetary landings. With her low cargo capacity, she usually was found transporting smaller, high-profit cargoes, sometimes of an illegal nature. Found mainly in the Federation/Orion border areas, she was well known in some of the major ports there. 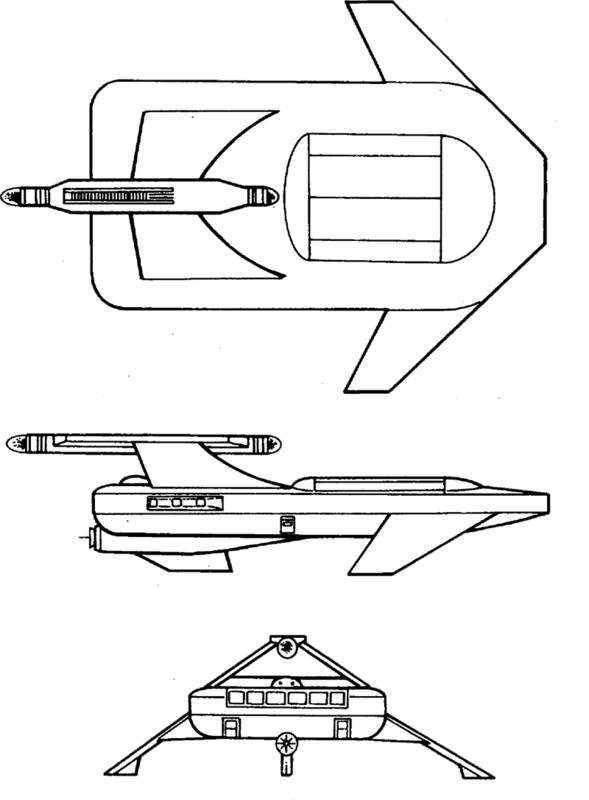 She was easily recognizable by her unique forward-positioned warp nacelle on her upper hull and by the large cargo hatch aft. The old-style sensor array and swept-back atmospheric winglets, combined with her worn appearance, complete the picture. There were no passenger facilities, but Captain Barnes was known to take on a paying crewman or two, usually being smuggled into one system or another. The Delight was constructed by one of the smaller ship construction yards, Belter Industries, located amid the asteroid field surrounding Dicameron VI. Named by her designer after the memory of a pleasant leave spent on the pleasure asteroid Alovar, she continued to be one of the most interesting tramp merchantmen amid the thousands that ply their trade within the Federation Exploration Zone until her eventual retirement in 2326 after 70 years of service. The Mk I was fitted with a simple navigational deflector shield, but Captain Barnes had frequently announced his intention to mount some eventually. Because of the poor defensive capabilities of the vessel, her usual tactic, when approached by any suspicious vessel, was to make an emergency warp out of the area and to ask questions later. This had been very effective in keeping the ship in one piece for most of her career. In 2280, Barnes and several of his “regular” crew members decided to make a major investment and upgrade the Ginny. Hoping to operate in more hostile territory, the addition of the FH-2 and the upgrade of the main torpedo to the powerful FP-1 nearly bankrupt the venture. Barnes finally obtained the military grade deflector he had always wanted and the Ginny was relaunched in 2287. The Mk II shifted from frontier operations to the more dangerous “outpost” operations near Orion and Triangle areas. From 2288 through 2315, the Ginny transported and traded luxury cargoes to frontier outposts, often running and gunning with Orion pirate vessels. By 2318, the loan for the new equipment was paid and the crew began to see a significant profit. Within six years, Barnes, now in his late 80’s, and his remaining crew had all seen massive profits and the decision was made to retire and sell the Ginny. The Ginny was sold to the quartermaster at Qualor II in late 2326. It was eventually sold for parts over the next 25 years.